And btw., I’m in urgent need of a good NetHack logo, png preferred, in 57×57 and 512×512 🙂 The one I’m currently using (from the Qt port I think) is 128×128 only, and I need the 512×512. I’m serious about this. If I don’t get one by tomorrow noon I’ll have to do it myself. And it won’t be pretty. This entry was posted in dvl, inethack, iphone, nethack, roguelike on 2009/07/16 by dirk. The game is now playable, what is lacking in commands can be compensated with the built-in keyboard, except for extended commands which need implementation. The port is currenty “bug-free” in the sense that I haven’t seen any of them in a long time, which doesn’t really mean anything. I’ve had some nasty crashes with map_glyph and my NavController, but they are all fixed. 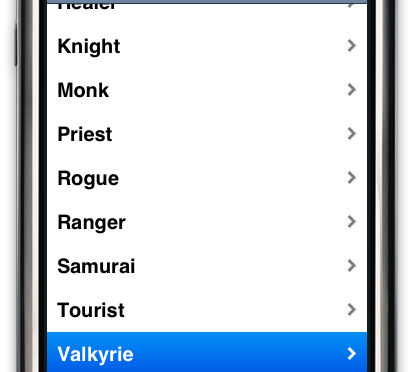 This entry was posted in dvl, inethack, iphone, nethack, roguelike on 2009/07/06 by dirk.